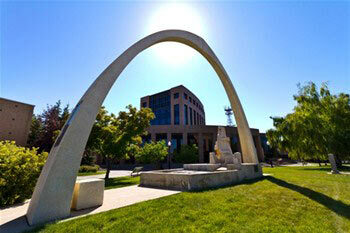 Lethbridge, Alberta is one of the warmest & sunniest cities in Canada with a pop. of 89,074. Our affordable, vibrant community is only two hours south of Calgary and is close to mountains and the U.S. border. We enjoy family-oriented neighbourhoods and have an array of recreational and cultural choices for people of all ages and interests. Our hospitality is second to none. With over 70 parks and 150 kms of trails throughout the community, we offer you an opportunity to explore our coulees and river valley park system whether by foot, bike or snowshoes. The Helen Schuler Nature Centre in the Oldman River Valley is open year-round and offers family friendly, interactive exhibits and unique wildlife viewing opportunities.. Just south of the Nature Centre you will find Indian Battle Park where you can relax for a picnic or climb on one of the giant sculptures found in this one-of-a-kind playground. Fort Whoop Up National Historic Site is also located in Indian Battle Park and is open on weekends. This site offers visitors a chance to see what life was like in a frontier outpost in Western Canada. A short drive, or walk, will take you to The Galt Museum & Archives, where stories of Lethbridge history are told. Don’t miss the fabulous gift shop, wonderful views of the river valley and the very famous High Level Bridge.